Medical personnel are now looking forward to computational techniques that merge as an adjunct to their work and a technology that empowers rather than threatens their role in medicine. Image analysis software is fast and make easy for experts to get 100% efficient data without compromising any sort of minute information. Halo Image Analysis Platform by Indica Labs is one step ahead with optimizing algorithms, annotating digital slides, and compute-time can lengthen time-to-results helping the lab to achieve quality analysis in the shortest time possible with flexible, purpose-built modules provide quick, quantitative results in oncology, neuroscience, metabolism, toxicological pathology, and more. Amide's a Medical Image Data Examiner (AMIDE) is a user friendly, open-source software tool to display and analyze the multimodality volumetric medical images and it runs on UNIX, Macintosh OS X and Microsoft Windows platform. However, there is the strong and growing need in the biology research community for accurate, automated image analysis and CellProfiler 2.0 has been engineered to meet the needs of its growing user base with more robustness and user friendly features along with new algorithms and features to facilitate high-throughput work. Machine learning systems to facilitate early diagnostics for higher cure and survival rates, neural networks for diagnosis validation, research-specific algorithms to find hidden patterns and valuable insights to improve drug development, segmentation solutions to pinpoint a treatment area and thus minimize possible damage to healthy tissue during an invasive procedure are the benefits of medical image analysis software. In addition, shorten learning curve, rapidly annotate slides, turbo-charge analysis speed, sorting and filtering capabilities and increase in the productivity because of same interface across all imaging modalities tends to increase the demand of medical image analysis software. However, lack of trained professionals, high cost of software and data security issues are the major constraints hampering the market growth. 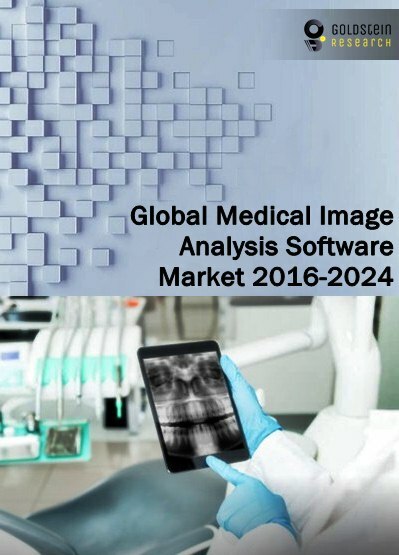 The medical image analysis software market is expected to reach USD 4.1 billion by 2024 from USD 2.52 billion in 2016, at a CAGR of 7.9% during the forecast period owing to rise in use of imaging equipment because of prevalence of chronic diseases, fusion of imaging technologies and growing applications of computer-aided diagnosis. Based on product type, integrated software is the dominating segment and is estimated to reach the valuation of USD 1.5 billion by 2024 owing to its compatibility with the equipment and fast processing. Hospitals hold the highest CAGR and expected to dominate the medical image analysis software market attributing to high number of installed base of diagnostic imaging systems. Regionally, North America medical image analysis software market is the most attractive market, growing at a robust CAGR over the forecast period owing to the better decision making and enhanced patient care outcomes.